M-Tech Innovations Ltd. offers the best quality MTUHFI-Mid Range RFID Card Readers to its clients in India and overseas. These Mid Range RFID Card Readers are compatible with multi-protocol and have integrated design. This RFID reader solution offers quick multi-tag reading which adds to its increasing use; furthermore it is water-proof which also proves beneficial for its users. 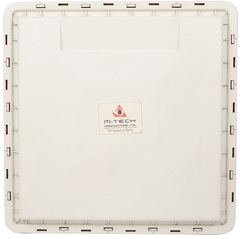 Our Mid Range RFID Card Readers products are used widely in diverse RFID systems. Having circular polarization without directional limit, the product is a Passive RFID card/tag reader with integrated antenna and weather proof design applied in outdoor. Applications based on Mid Range RFID Card Readers are utilized for Person, Vehicle Tracking systems and so on; these applications can efficiently be used upto the distance of 6 m.
Multi person tracking within stipulated area of distance of 6 m.
No need to touch any equipment for being identified. Light weight & compact size device giving complete convenience. Reliable stability of the reader prevents overlapping identifications of tags. The device offers encrypted Tag ID communication.